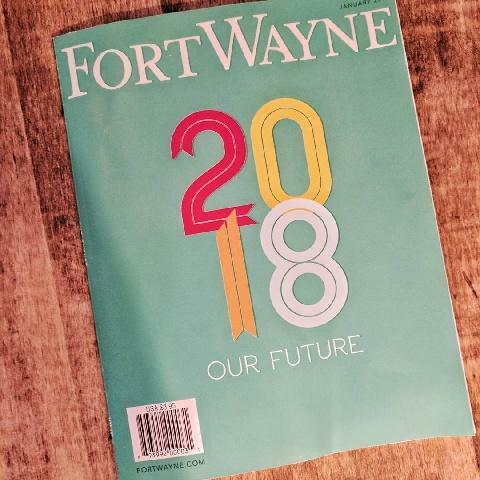 We're super excited to share with you that we were featured in the latest issue of Fort Wayne Magazine. If you haven't gotten a chance to read it, you can check it out at one of these newsstand locations. And a huge thank you to those who've helped spread the word about our little shop. It's thanks to you and those that follow us on Instagram and Facebook that we had this great opportunity. You may have noticed a few updates to the website lately. We're currently in the process of getting an online store up and running. Please check back in a few weeks to see some of our new inventory. We can't wait to debut some new t-shirt designs with you! I'll admit, I've worn mine three times already and I've only had it for about a week and a half. The shirts will be available at our next Tiny Shed opening as well. Merry Christmas from all of us at the Tiny Shed! It may be a few days late, but we just wrapped up our family Christmas get together tonight and we wanted to take a minute to thank all of you for all you've given us this year. Christmas has always been a time to remember the ones we love and to show them how much they mean to us. It doesn't matter if you give a gift or just share a chat with someone over some hot cocoa. It's the feelings that we share through those actions that make Christmas and the holiday season so special. And that's what we love about the Tiny Shed; we get to be a small part of that love when you find that perfect gift for someone in our shop or if you just browse while eating a pumpkin bar and hanging out with friends. So thank you to all who stopped by our tiny, little storefront shed to say hello and chat by the chiminea. And also thank you to those who stayed in the shed as part of our glamping. All of you are what make the Tiny Shed what it is. So here's to you: May your 2018 bring you as much joy as you've brought us! With the summer heating up, we decided to go cool and coastal with our latest home staging with Wannemacher Design Build and Mike Thomas Realtors. This two-story home turned out gorgeous in shades of navy and green with pops of pink. You may notice some familiar pieces from our last home staging, but they look totally different with new accessories. It's amazing how many looks you can create using just a few staple pieces. Emily did some pink watercolor paintings to add a splash of color to the dining area, giving the room some much needed contrast. If you want more information about this house (14763 Manzanar Cove), check out the listing on the realtor's website. Also, stay tuned for more updates about the Tiny Shed or come visit us the first and third Saturday of the month all summer long. 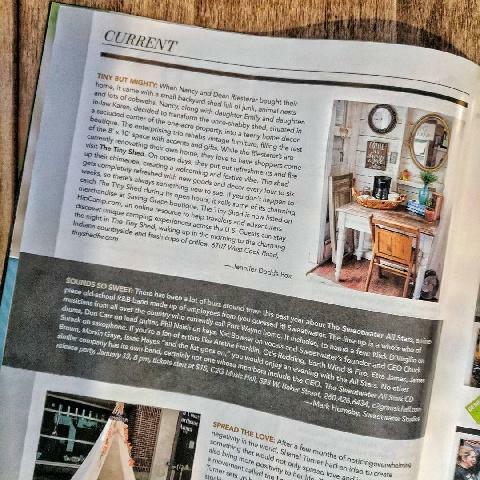 In case you weren't able to make it out to the Town & Country Home and Specialty Retail Tour the last two weekends, here's a virtual tour of the home filled with all of the wonderful furnishings from our shop and select pieces from Saving Grace Vintage and Fort Wayne Upcycle by Jill Keszei. Also, a special thanks to Wannemacher Design Build and Bob Fisher of Mike Thomas Realtor for the opportunity to stage such a beautiful home! If you were able to make it out to the tour, scroll to the bottom for a big announcement. While there are hook-ups for a TV above the mantle, this sign by Emily almost makes you want to forgo the latest shows and cuddle up with a book in one of these vintage wood and leather chairs. And in case you were wondering what it looked like, here's the finished table from our last post. The scroll work on this dresser is simply incredible. You'd be surprised at how much detail can be brought out with just a little bit of distressing. While I love this room as an office, it could easily be converted into a bedroom as it shares a Jack and Jill bathroom with the other bedroom. While the location may have changed, our excitement hasn't. The home on Manzanar Cove featured in our previous post has sold, but we're thrilled to be staging another gorgeous home from Wannemacher Design Build for the Town & Country New Home & Specialty Retail Tour. Located in the Whisper Rock subdivision, the 4,600 sq ft home on Artisan Pass features an open concept and lots of natural light. Here's a sneak peak before the tour opens this weekend. Here's Dean helping set up the dining table and chairs. You'll have to come out to the tour see the finished product, but we love this modern take on a simple farmhouse table. The living room features a warm neutral color palette with a mix of re-purposed vintage pieces with some modern pieces like this amazing couch from Magnolia Home. And of course we had to get this little guy's seal of approval. A huge thank you goes to Pam Kessie from Saving Grace Vintage and Jill Keszei of Fort Wayne Upcycle by Jill Keszei (also available at Couture Cottage) for including some of their fantastic pieces and helping us set up. If you haven't already, you have to check out their work. They both do amazing things with re-purposed furniture and are all-around awesome people to work with. To see the rest, you'll have to come see us this weekend (April 29-30) or the following weekend (May 6-7) from noon - 5pm. To see all of the homes on the tour make sure you check out the tour website or the flyer for a list of all builders and homes included in the tour. The weather today may not show it, but spring is almost here and with it we've got some exciting new projects in the works! In addition to our regular sale openings, we have a chance to show off our Tiny Shed style at this spring's Town & Country New Home & Specialty Retail Tour and you'll get to see our process right here on the blog. We'll be staging this absolutely gorgeous home built by Wannemacher Design Build. You'll have to stay tuned to see how we find furniture and design each space, but here's a sneak peek with some "before" photos of the interior. The sliding barn door to the right leads to a den/office, while if you head straight forward, it opens up to the rest of the open floorplan main living area. Just look at all that natural light! And I don't know about you, but I would love to have that much built-in storage. View of the mud room leading into the laundry room. There's a lot more house to see, so check back over the next few weeks as we work on filling it or stop in during the home tour April 29 & 30 and May 6 & 7. For more photos or information about the house, you can see it on the Mike Thomas Associates' website @ www.mikethomasrealtor.com. "Coffee is always a good idea." Yes, the radio still works! We'll be open from 9am until 4pm tomorrow (Saturday, January 28th). If you see something you like, but can't make it out, send us an email at thetinyshedfw@gmail.com or send us a message on Facebook or Instagram (@thetinyshedfw). When Nancy & Dean first moved in, the tiny shed on the edge of the property only had one thing going for it, a new roof. The paint was peeling, the interior was dark, and we're not entirely sure how many animals had been living in it. But with a few weekends of hard work, we were able to turn it into the tiniest of storefronts. The inside was cleaned out, the walls were painted, floor was laid, a door was salvaged, and a path laid in. It was transformed just in time for our first opening in October 2016. With pumpkin bars and hot cider to keep everyone warm on the chilly fall day, the October opening proved that maybe we weren't as crazy as we had thought and the Tiny Shed officially became more than just a daydream shared among family.